Premiere is a powerful video-based theme that is custom post driven, separating your video posts from your blog content, but under a single video-oriented website. With a custom single video page template and great social sharing links, the option for your site visitors to recommend videos and a featured home page slider this theme helps videographers, and movie fans alike – with great custom-ability. This theme is an ideal choice to build a custom themed video sharing website for a specific niche or for more general audience as well. The premiere theme has a custom home page featured slider to showcase particular video posts, all powered by jQuery and you have full control over what appears here and where the caption must be positioned. 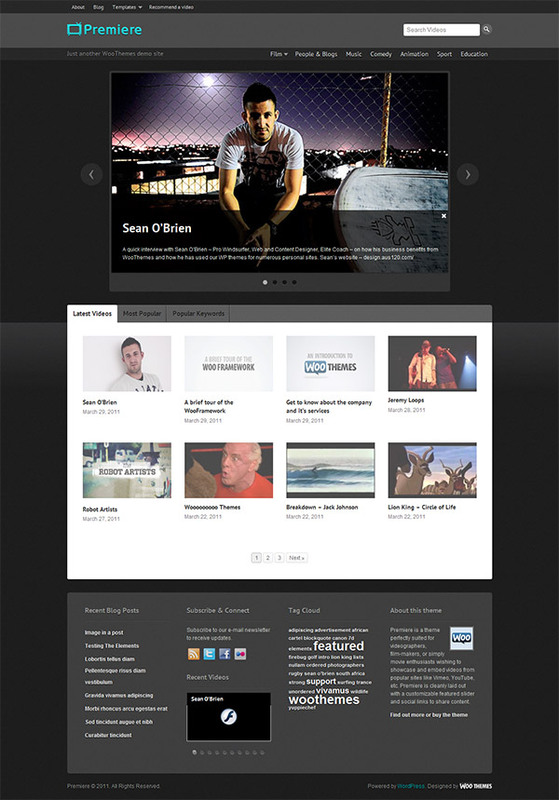 You also get a custom home page layout with video tabber and widgetized regions for blog and other content. A neatly designed single video page template that has social links allowing you to share your video on Facebook, Twitter or even email a link to the post. Related videos show below the video content. The theme takes full advantage of the new custom post types functionality than came with WordPress 3.0, so adding video posts is dead easy. You can customize the typography in the theme to suit, and there is full support for Google Fonts in the font selector. The theme includes 11 alternative color styles which you can preview in the demo, and also has styling options for background color/image and setting link and button color.